Adults forget all that they do while reading. We are predicting, making connections, contextualizing, critiquing, and already plotting how we might use any new insights or information. Yep, we do all that when we read. As teachers, we need to train students in each of these skills, and begin to do so early on. I was recently in a second-grade classroom where 70 percent instruction was in English and 30 percent in Spanish. Most of the children spoke Spanish as their first or home language. As the students sat on the carpet and the teacher read to them, she'd pause every few minutes so students could ask questions or make a comment. Every student would start her/his comment by saying, "I would like to make a text-to-text connection, or I would like to make a text-to-self connection..." It was clear that these young children had been taught this analysis skill; they had been given a strategy and language to go deeper in the text -- and this an age where children are still learning to read. Before reading, look at any titles, subheadings, charts, graphs, and captions. Talk out loud as a whole group, inviting students to make predictions about what they are going to read. Scan the text and ask students to point out words or phrases that are new to them, confusing or they wonder about at first glance. Look at the structure of the text: Is it funny, sad, realistic? How do we know? Is it fiction -- a poem, a story? How do we know? Is it non-fiction -- a letter to someone, a newspaper article? How do we know? 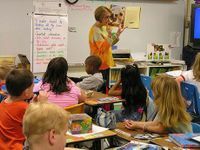 Providing students with knowledge of the text structure and its features will help them with comprehension and to identify the author's goals or intent. This strategy confronts the passive reading approach. Rather than tell students to "just read" (which results in low recall), we say, "Here's your mission as you read. Look for..." They can be reading closely in search of: humor, author's purpose, use of literary devices (such as foreshadowing, imagery), facts, confusion, and context clues for new words. These steps for marking the text come from AVID: a) number paragraphs, b) circle words, phrases, names, dates that stand out, and c) underline author's claims and important information connected to those claims. The final step is to teach students how to write in the margins (asking questions, for example). Teach students the text-to-self, text-to-text or text-to-world strategy talked about earlier. When you read as a whole group, model it often: This reminds me of (my birthday party, a poem we read, that snowstorm last year). We often expect students to do this one without providing the necessary support or models. Think how hard summarizing is for even adults and then think about students who are still in the stage of decoding. Here are two strategies I have found effective with both children and adolescents: Magnet Summary and Sum it Up. Remember to model these summarizing tools in class, followed by guided practice before requiring them to summarize on their own. One of the ultimate goals for all teachers (regardless of grade or content) is to prepare students to read deeply and critically on their own, just as adults do. How are you equipping your students for this task? We'd love to hear from you! Please share in the comment section below.